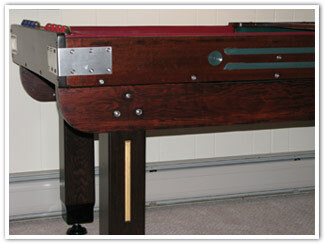 Here are some pictures of Steve P's American Rebound refinishing project. The board was dropped off after being stored in a barn. There was water damage that warped the board. It was delivered partially disassembled. I could not find a photo of the board on the Internet, so I never knew what it was supposed to look like until it was restored and re-assembled. 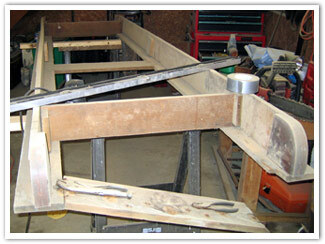 The playing surface was split with wedges to re-glue and clamp in a jig. This reestablished a flat cross-slope. 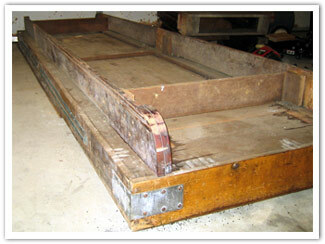 The maple surface was originally constructed with many metal pins and glued, then clamped together. A large planer was not available, so the board was sanded in place using an orbital sander with 150 grit paper. 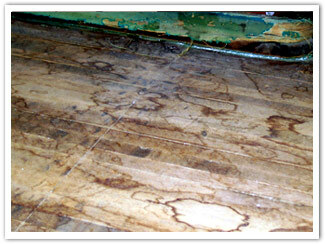 A two-part, self leveling, polymer epoxy was poured on the surface and spread with a notched trowel. 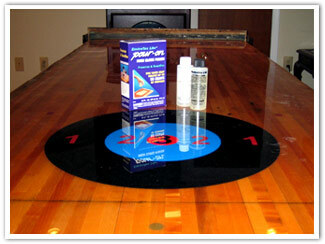 I used more than one gallon of epoxy for complete coverage and averaged 1/8" thickness. The underlying numbers were a vinyl decal. All screws were replaced with stainless steel hardware. Most original hardware was bent or unuseable. New ss corner brackets were fabricated. 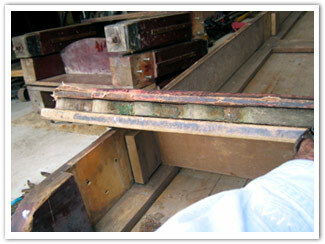 The bumpers were re-used as new natural gum rubber material is not yet available. 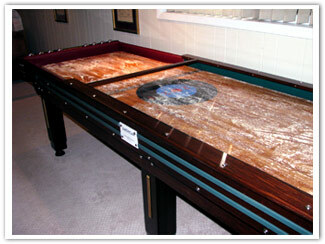 The bumpers were covered with a rubberized-back pool table felt . 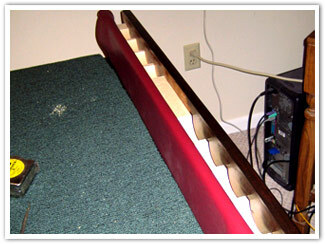 Original Leg levelers were carriage bolts, replaced w/composite levelers.